Eliason Food Service & Restaurant Doors | Jersey Architectural Door & Supply Co.
Kalamazoo, MI-based Eliason Corporation is a major player in the national food service door and restaurant door markets. Eliason is famous for manufacturing its Easy Swing double action, impact resistant partitions for high-traffic food service applications, and Econo-Covers to keep cold food cold while cutting commercial utility costs. But the company is much more than just plastic partitions – Eliason food service & restaurant doors catalog covers a wide range of food service applications, making it a one-stop-shop for restaurant owners and food distributors nationwide. The half-century old door manufacturer offers dining and kitchen doors, cafe and gate doors, flexible top-mounted doors, insulated doors, cooler and freezer doors, entrance and vendor doors, hands-free strip doors for back of the house energy-saving applications, their famous Econo-Strips® to help reduce refrigeration loss in display case applications, as well as door frames and parts. For nearly 100 years, Jersey Architectural has been a valuable door supplier for Northeast U.S. restaurants and food service companies. We always stock the highest quality building materials from trusted manufacturers like Eliason, which our prospective customers can see on display any day of the week at our Atlantic City showroom. 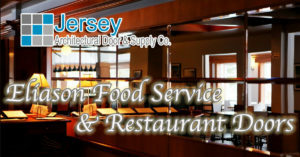 Here at Jersey, we have an in-house team of architectural technicians and advisors who can help you get the best performing, most durable and highest energy rated food service door perfect for your establishment. Fire & Storm Rated Doors: Eliason’s FRP and AMP-clad doors are available with 30, 45, 60 and 90-minute fire ratings. They are available in any standard door line through molded FRP or AMP cladding, stained finishes, as well as custom painted color options. Bug, Bird, Vinyl, and Wire Mesh Doors: Eliason’s EasyShield® roll-up and sliding doors provide ventilation while still acting as a deterrent to insects, birds, and unwelcome personnel. EasyShield® doors are designed to be easy to use in either interior or exterior applications, even in conjunction with other doors. Strip Doors & PVC Roll Goods: Eliason offers a full line of clear flexible strip doors and mounting options for restaurant and food service cold storage environments. Their Strip Doors provide maximum visibility for safety and offer an economical solution where thermal separation is required for energy conservation and employee comfort. They are suitable for pedestrian, cart, pallet jack and forklift traffic, and come in a variety of material types, sizes and thicknesses. Industrial & Insulated Curtains: EconoSpan® Industrial Curtains maximize available space and provide a level of mobility and retractability not possible with permanent walls. Eliason manufactures these curtains from the most durable materials, with flame-retardant vinyl and mildew-resistant thread. They are ideal for refrigerated areas, food processing facilities, walk-in coolers and freezers, distribution centers or any other applications that require a temperature control barrier. Want To Know More About Eliason Food Service & Restaurant Doors?